EIM extends its sincere thanks to Sandy & Denny B. for hosting our group again at this year’s EIM Quad Cities Meet-n-Eat on February 23rd! Additional thanks to everyone bringing goodies to share and to Juli B. and Wendy S. for the photos. 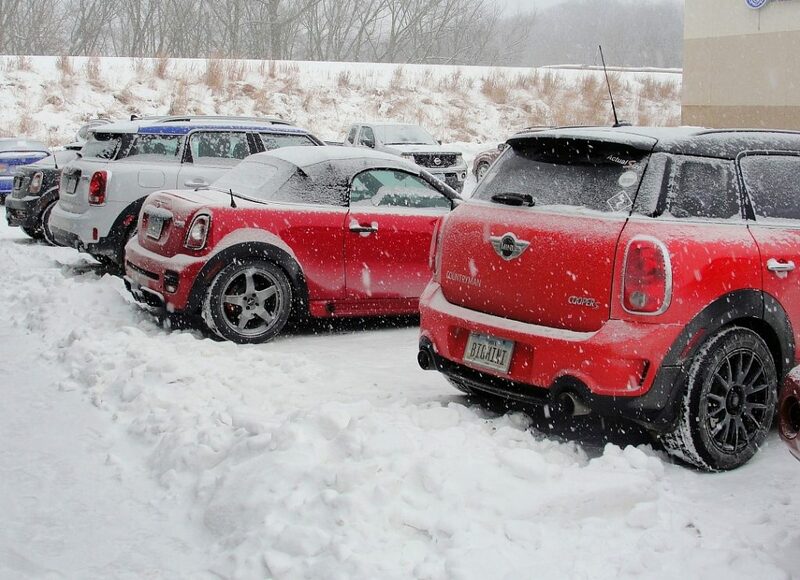 Finally, bonus points to Cindy C. and Steve & Juli B. for decorating the driveway with their MINIs on this icy day! Cedar Rapids Meet-Up in March! 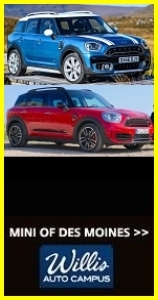 Eastern Iowa MINIs hopes whatever package Santa leaves under your tree — and maybe the special gift wrap it comes in — brings you much fun and joy aplenty. To all of our MINI faithful, friends, and families, we wish you a very happy holiday season, Merry Christmas, and Happy New Year! 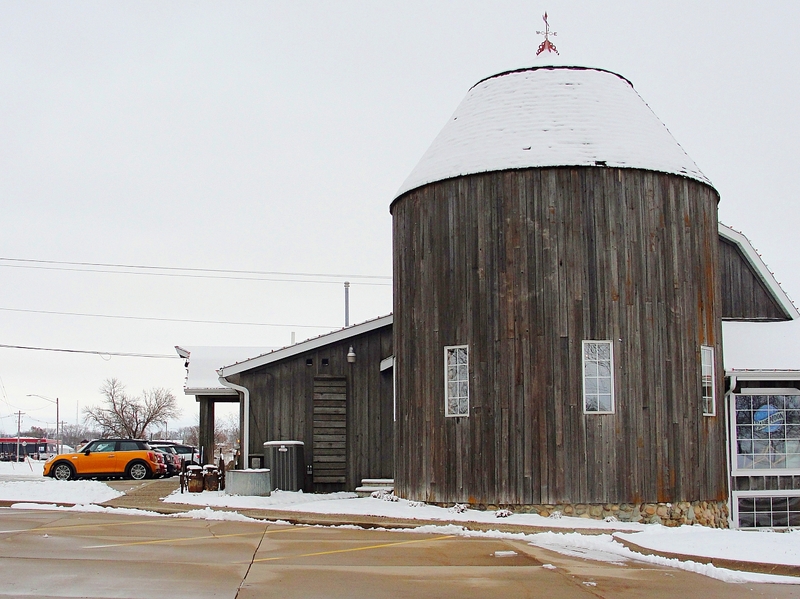 Thanks to our motorists who braved the winter road conditions and made it out for our final gathering of 2018, the EIM Meet-n-Eat at the Country Junction held on November 17th in Dyersville. 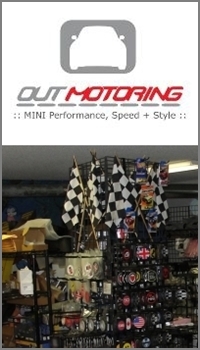 It was a blast looking back on all of the fun times and great destinations visited over this past motoring year. Superb food and fellowship, as always. 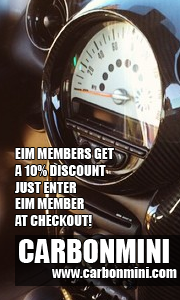 Special congratulations to Cindy C., our 2018 EIM Motorist of the Year! See you at the Wig and Pen Pub in Coralville next January! 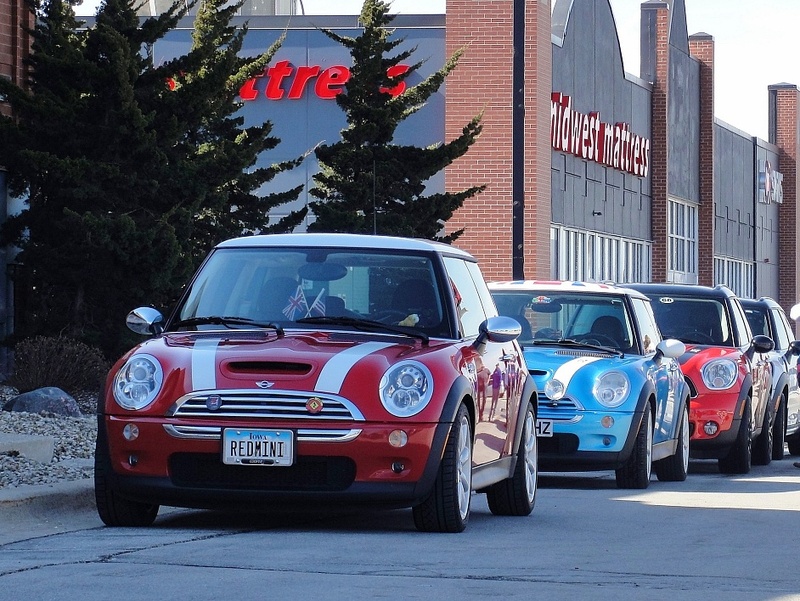 Eastern Iowa MINIs (EIM) and the Central Iowa MINI Club (CIMC) enjoyed another spectacular collaboration this past Saturday (10/13) as we teamed up for the 16th Annual Iowa MINI Cooper Fall Tour. 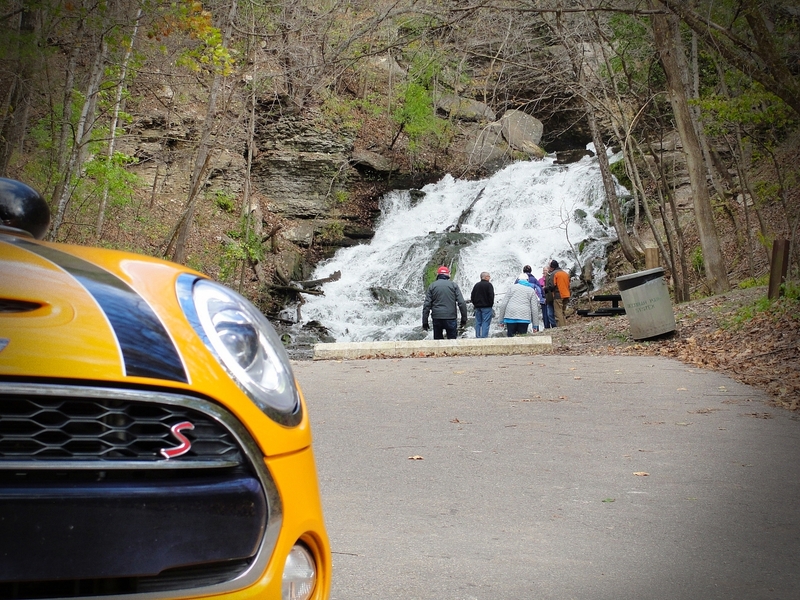 This year’s drive was designed also as a tour of noteworthy Iowa waterfalls. The route began in Backbone State Park near Dundee, traversed much of the northeast Iowa bluff country, then headed west to the prairie with a finish at Beeds Lake State Park near Hampton. If you count the small, lower falls in Backbone and Dunning’s Creek spilling into the Upper Iowa River, our group enjoyed no less than 12 waterfalls along the way! While the day was a bit on the cool side, given the fact of nearly 10 straight preceding days of rain (and, as it turns out, snow on the following day!) we couldn’t have asked for much better conditions. 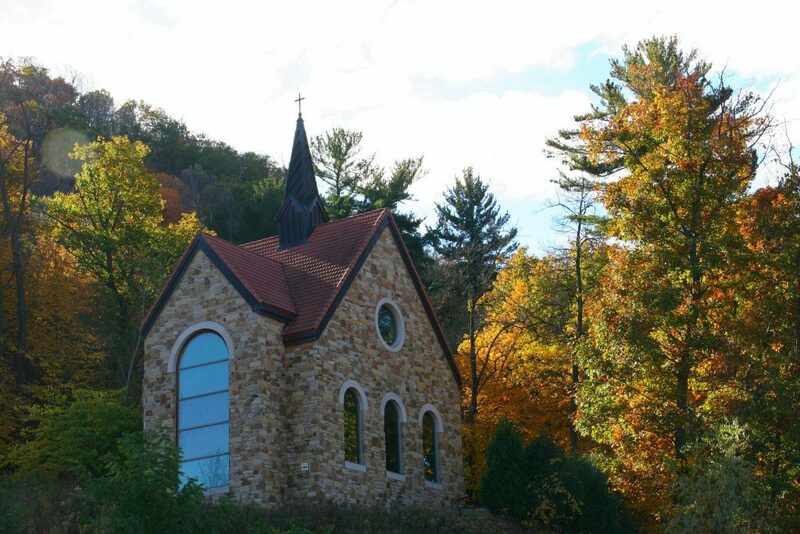 The sun did make its presence known on occasion, providing for added highlighting of the vivid autumn colors. Both MINI groups made a great showing and we thank everyone for making it a fun day. We especially thank the folks who came over from the Des Moines area on Friday in order to be ready to go Saturday morning. 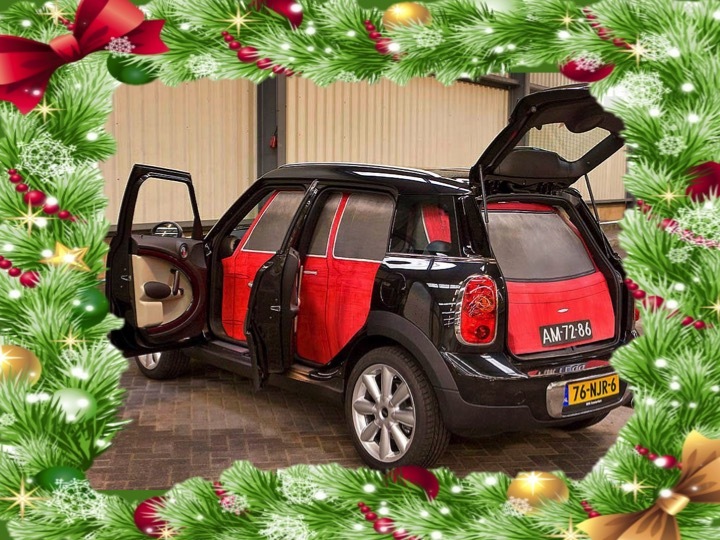 We hope everyone enjoyed the drive! Looking forward to #17 next year! After having just returned from our prior week adventure to the U.P., we were blessed once again with great weather for our traditional trip up to the Wisconsin bluff country orchards as part of our annual Gays Mills Apple Run held on Saturday, September 22. While there was evidence of the prior month historic flooding along the Kickapoo River, thankfully the town of Gays Mills appeared to be recovering nicely and the local area was bustling with visitors and activity. 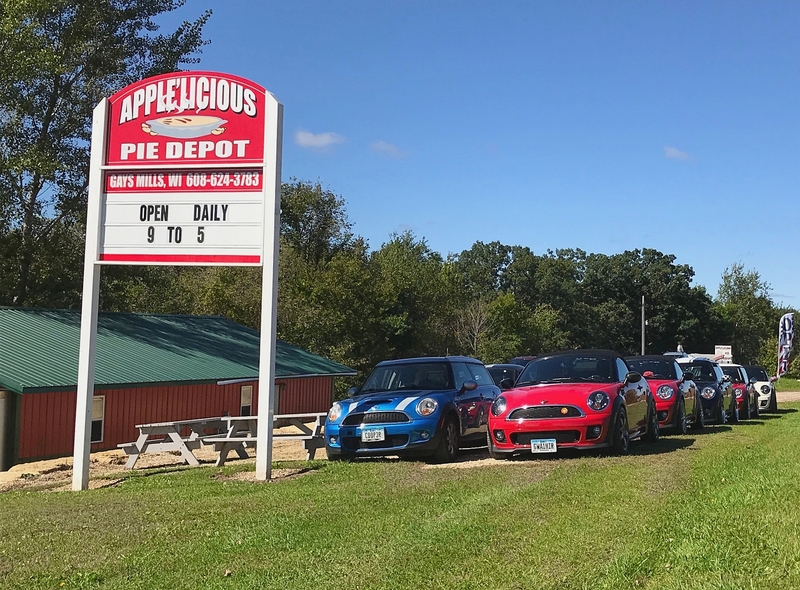 We managed to hit all of our favorite stops including Sunrise Orchards, the Apple’licious Pie Depot, and a returning pit stop at the Potosi Brewing Company. Thanks to all who came along and made the day so enjoyable. 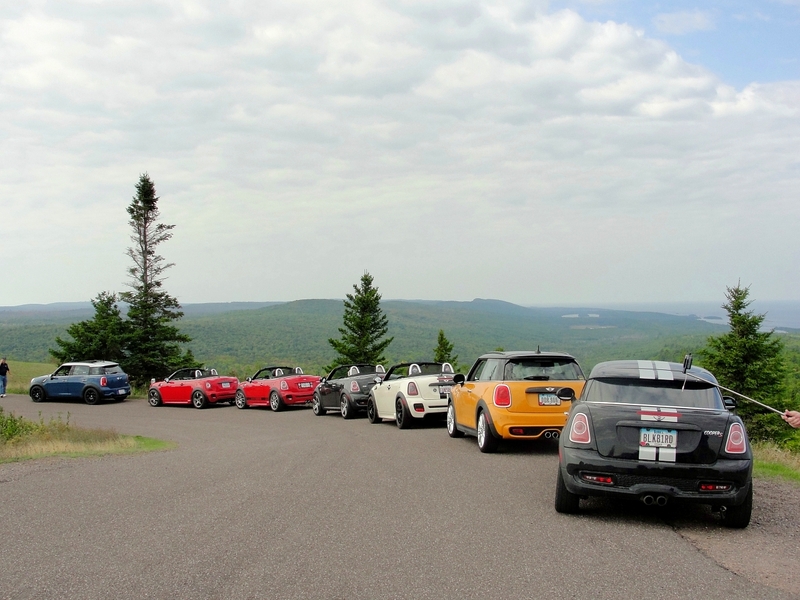 The EIM to the Lake in the Clouds event, our MINI Cooper adventure to the Upper Peninsula of Michigan, just wrapped up this past Sunday after five incredible days of exploration and fun. Mother Nature blessed us with great weather and the sights and sounds of Houghton and the surrounding area couldn’t have been any more enjoyable. Our Thursday drive took us west to the Porcupine Mountains (known locally as “The Porkies”) with an initial stop at the park’s visitor center. This was followed by the climb up to enjoy the view of the stunning Lake of the Clouds. We then followed the South Boundary Road around the park with a stop and short trail hike up to Summit Peak, the highest point in the park. Lunch in the town of Wakefield was facilitated by the time zone change that managed to get us in the door prior to closing time. The afternoon was consumed by our transit back to Houghton through the emerging fall colors. Friday found us skirting up the winding roads along the western edge of the Keweenaw Peninsula. The scenic and interesting stops along the way are almost too numerous to mention, but here are just a few: the Eagle River Bridge and Falls, the Jampot monastery-owned shop, Jacob’s Falls, the Eagle Harbor Lighthouse, the beach at Eagle Harbor, the Brockway Mountain summit, and the scenic overlook along Brockway Mountain Road above the town of Copper Harbor. Lunch and shopping in Copper Harbor was followed by a transit south along beautiful, curvy US-41 and then east along Lac La Belle Road along the coast for a stop at Haven Park Falls and ultimately to the town of Gay (and its famous bar) for ice cream prior to our return trip to Houghton. On Saturday we headed southeast along the Keweenaw Bay towards the town of Baraga and a stop at the Bishop Baraga Shrine. We then did some fun exploring around Silver River Falls located a few miles northeast of L’Anse, and followed more roads south through Alberta and Covington, and then north along Plains Road (until we ran out of pavement!). An early return to Houghton allowed our folks to break off for individual adventures. Among these included a sojourn into the deep bowels of the Quincy Copper Mine, the center of the massive copper mining industry that defined the area from the mid-1800s until the 1940s. We all gathered for our get-away meal that evening at the eclectic Continental Fire Co. in Houghton and toasted our series of fun times and another set of great memories. Thanks to all of the EIMers who were able to come along and be part of this adventure! Looking forward to our Gays Mills drive this Saturday! Thanks to all of the EIMers who came out for this year’s Holy Cross Festival and Parade held in Holy Cross this past Saturday. The weather was superb and the parade (including our pre-party at the assembly point and the bountiful feast afterward) as great as ever. 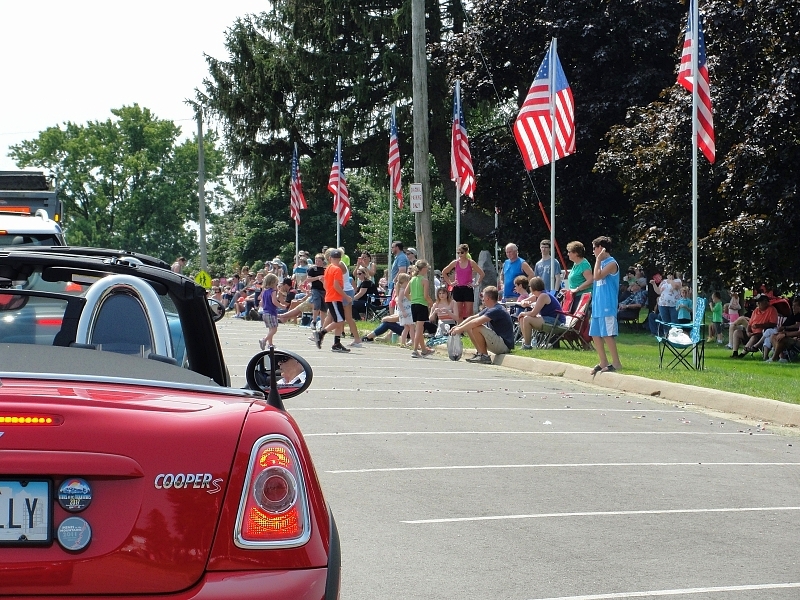 Over the past decade of involvement our MINIs have become a Holy Cross Parade staple and enjoyed by everyone. 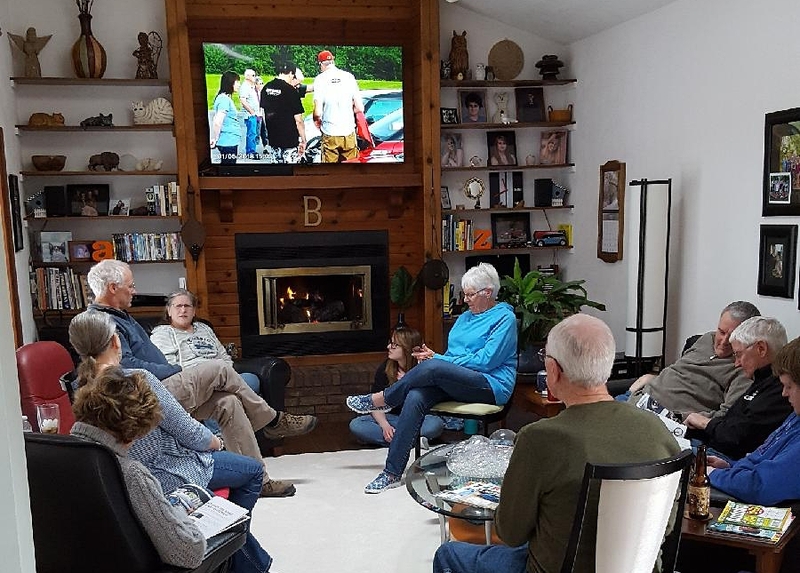 As always, our heartfelt thanks go out to Linda & Tom R. for their hospitality, for the amazing (as always) local broasted chicken, and for opening up their home to our group. The “Purple Haze” home brew was an extra special treat. Thanks to everyone who contributed their delicious additions to the food selections.